at the right time. Boom. And unlike some of the other guys, we take those new Facebook Lead Ads and pull them from Facebook onto the Infusionsoft platform too in real-time – all included at no additional charge. Why? Because it isn’t hard! But with 6 competitors on the market currently in various price points and multiple offerings, it can be difficult to do an apples to apples comparison! Below you’ll see information on all 7 Facebook Custom Audience and Lead Ad synchronization apps with direct question comparison. If we missed one…Let us know! There are obvious challenges given the custom nature of each app, but we have done our best to show each app in its native form, offerings and price points. 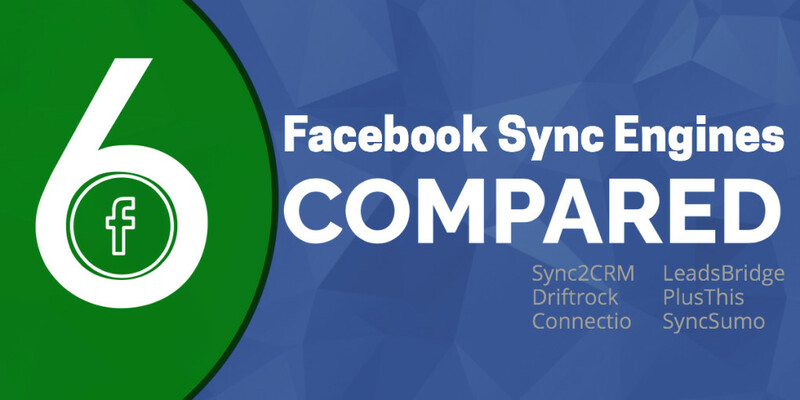 Overview: Sync2CRM Automatically Automates Your Facebook Ad Campaigns with Infusionsoft every hour including real-time Lead Ad updates and from multiple Facebook & Infusionsoft App Accounts. 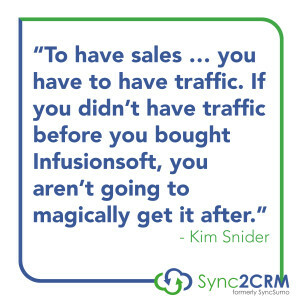 Sync2CRM automatically syncs your Facebook Ad data with Infusionsoft so you can save time, save money, automate your advertising and do things with Facebook ad campaigns you could only dream about before. What does it cost: Starts at $42 a month for up to 20,000 contacts – $245 a month for up to 500,000 contacts. Custom plans are created for Enterprise companies with over 500,000 contacts. Save 20% with annual billing. Members of Digital Marketer Lab are able to use a lifetime discount code for 20% off the monthly cost. UPDATE: As of March 2016, there is also a Lead-Ad only plan available for $12/month (as of the time of this writing). What about Facebook Lead Ads? Free or cost Extra? Yes, available at all levels and included in the standard monthly fee. Can they sync Facebook Custom Audiences? If so, how often? Free or cost extra? Yes, Facebook Custom Audiences are synchronized every hour with all of your Infusionsoft data with a true batch sync engine. This is available at all levels and included in the standard monthly fee. How many Facebook accounts are included? Multiple Facebook accounts are included at all levels as part of the standard monthly fee. How many Infusionsoft App accounts are included? Multiple Infusionsoft App accounts are included at all levels as part of the standard monthly fee. What kind of Facebook Ads Training is Available? A weekly User Group is available in most Sync2CRM and Sync2CRM users are encouraged to attend. Meetings are recorded and available for users on a private membership site. What kind of Infusionsoft Training is Available? A wealth of Infusionsoft how-to information is available on the Sync2CRM blog for free in addition to comprehensive “Learn Infusionsoft Fast” training available for a fee. Information and courses are created and taught by Kim Snider, the Infusionsoft’s 2014 Most Helpful Partner, an award-winning entrepreneur with 13 companies under her belt, including a two-time Inc List honoree. Kim’s super-power is taking complex subjects and making them easy to learn and implement. She is widely regarded as an outstanding trainer and speaker. Is a free trial or discount available? A 30 Day free trial is available at all times. Members of Digital Marketer Lab are able to use a lifetime discount code for 20% off the monthly cost. Customer Support: I tried using the instant chat via Intercom and I was directed to put in my email to respond to me when they could. I received an immediate response from “John” who was able to answer all my questions. I tried calling customer service and was left on the phone or directed to leave a voicemail. What does it cost: Driftrock does not openly publish their pricing guides for Flow – you must request a demo and speak with a sales representative and after sending my info over – no one has reached out. Based on information from GetApp, pricing starts at $265 a month up to 150,000 contacts up to $855 for up to 1 million contacts. What CRM and Email platforms are available for sync? Flow works with Constant Contact, Intercom, Infusionsoft, Shopify, MailChimp, Hubspot, Campaign Monitor, Segment.io, Flurry, Insightly, Kissmetrics, Mixpanel, Spree, Magento, and Zoho are listed. But it should be noted that Lead Response only coordinates with Intercom, Infusionsoft, MailChimp, Segment.io, Flavio, and Sparkroom. What about Facebook Lead Ads? Free or cost Extra? DriftRock Lead Response’s monthly subscription fee is 5% of your lead ad campaign spend, A minimum monthly fee of £200 applies (roughly $250). Can they sync Facebook Custom Audiences? If so, how often? Free or cost extra? Yes, every three hours with a true batch sync engine on their premium Flow plan. What kind of Facebook Ads Training is Available? Driftrock does not offer formal training, but they do offer some free training on Facebook on their Driftrock blog. Customer Support: I requested a demonstration, but no one ever got back to me. I sent a message to support with a question concerning pricing and how the sync engine operates compared to other similar services – and have also not heard back from Driftrock. Update: 4 weeks later…still no response. The single most important element of successful, long-term, scalable Facebook campaigns most of you are missing! How to create campaigns in Facebook and Infusionsoft that work together to increase conversions and drive costs down! Overview: Like Driftrock, Connectio breaks up the product into 2 separate entities: ConnectAudience and ConnectLeads. For ConnectLeads: Add new subscribers to your email lists – automatically and dynamically – directly from inside Facebook using Lead Ads! For ConnectAudience: Manage your custom audiences directly between your Autoresponders and FB ads manager BUT as of publishing time – their product is not available, asking you to signup for the waitlist. Upon clicking, I am sent to the top of the page and nothing happens; no information is collected. I’ve been told that ConnectAudience is currently only available to ConnectLeads customers at the moment. What does it cost: ConnectLeads is $47 a month, $197 a year, or $297 for a lifetime access pass. This does not include ConnectAudience which is currently not available to the public; only current ConnectLeads subscribers for an extra $297 for a lifetime account. Connectio has said that once the program is open to the public, it will not be available at a lifetime license. Can they sync Facebook Custom Audiences? If so, how often? Free or cost extra? ConnectAudience is currently only available to ConnenctLeads customers for an extra $297 for a lifetime account. How many Facebook accounts are included? Every ConnectLeads account is limited to only 1 Facebook Ads account at any given time. If you want to use ConnectLeads on multiple Facebook Accounts, you’ll need to purchase multiple licenses. How many Infusionsoft App accounts are included? ConnectAudience allows for several Infusionsoft accounts to be connected with unlimited contacts. What kind of Facebook Ads Training is Available? Free Facebook information is provided on the Connectio Blog with further information and resources provided as bonus material when you purchase their license. Their bonus material provides a full training courses with both Connectio Products. Courses are divided into 2 sections: how-to’s (how to use the products) & strategies (in-depth & clever strategies to get more results using FB Ads). Customer Support: First sent to commonly asked questions section. A support ticket system is available, but requires you to create an account. Took three days for a response from early Friday to mid day Monday. Overview: LeadsBridge will Sync Lead Ads in real-time with your CRM/Autoresponder and get in-depth insights. What does it cost: $97 yearly for the personal level that includes one Facebook account, 3 tags or list and basic level fields, $197 yearly at the Marketer level for 2 Facebook ad accounts, 12 list or tags and advanced fields and $247 yearly at the Hero level that supports unlimited Facebook ad accounts, unlimited lists and tags, insights, and advanced fields. Customer Support: I tried using their basic contact form for customer service. My question was answered by direct email within 3 hours. Overview: PlusThis is a subscription service, created by Sixth Division, providing a wide variety of tools that extend the functionality of Infusionsoft. What does it cost: PlusThis costs $79/month. All features are included. There is no annual plan. What about Facebook Lead Ads? Free or cost Extra? PlusThis does have Facebook Lead Ad support included in the standard monthly fee. Can they sync Facebook Custom Audiences? If so, how often? Free or cost extra? PlusThis takes a goal-oriented approach to keeping Facebook Audiences up to date. What this means is that you can, in real-time, move contact records between custom audiences as they accomplish various campaign/funnel goals in Infusionsoft through tags and API calls in real-time. Additionally, if a user ever wishes to force a sync for a given “list” or tag, they can use the “sync now” button on the Feature. The automation is not handled through a “sync engine”, but by touch points and tags. This offers the ability to move a contact to a list in real time, but could be problematic with large traffic – nor does it take in account contacts deleted until requesting and clicking the “sync now” button. How many Facebook accounts are included? Only one Facebook “user” account permitted, but the user can have as many ad accounts attached as desired. What kind of Infusionsoft and Facebook Ads Training is Available? PlusThis doesn’t offer paid training, but they do offer some free training on Infusionsoft and Facebook on their PlusThis blog. Customer Support: Easy to submit a ticket utilizing their online feature. I had a reply beck in about 2 hours. Overview: SyncSumo 2.0‘s new platform syncs all email addresses & phone numbers from each of your contact records to maximize the reach of your Facebook custom audiences and lead ads. What does it cost: Starts at $30 a month for up to 2,000 contacts – $250 a month for up to 1,00,000 contacts. Custom plans are created for Enterprise companies with over 1,00,000 contacts that need to be synced monthly. What CRM and Email platforms are available for sync? SyncSumo 2.0 supports Infusionsoft, MailChimp, ActiveCampaign, AWeber, GetResponse, GoToWebinar, WebinarJam, and Slack. Can they sync Facebook Custom Audiences? If so, how often? Free or cost extra? Yes, but not on the free level. SyncSumo 2.0 list that their RealSync will provide you with 3 options when syncing a list with Facebook custom audiences; Every 15 minutes, daily and weekly included at no additional charge. How many Facebook accounts are included? SyncSumo 2.0 is currently posting that Multiple Facebook, CRM and mail accounts are all included at all levels as part of the standard monthly fee. However there is no way to add multiple Facebook accounts on the app side. Customer service is saying they can add additional accounts manually on their end. What kind of Facebook Ads Training is Available? Facebook advertising content is available free on the SyncSumo blog crowdsourced through industry experts. Is a free trial available? 14 day free trial on all accounts. There is a Forever Free account but only up for 3 leads. Customer Support: I tried calling customer service and was left on the phone or directed to leave a voicemail. I tried using the instant chat via Intercom and I was directed to put in my email to respond to me when they could – a response by email was received approximately 1 hour later. I spoke with Todd at length and he was most helpful. There were several times, where they didn’t know the answer and had to get back to me. Overview: MyFusion Helper is a new platform to the Facebook Ads platform. Like PlusThis, they have several tools (35 currently) to help your Infusionsoft Campaigns. This app offers realtime syncs as contacts move through your funnel and hit specific Infusionsoft campaign points; easily moves contacts from one custom audience to another, or puts them in various different segmented audiences. What does it cost: $29.95 monthly for the tools available currently. According to their website FAQ page, It’s very likely they will move to tiered pricing in the future. What about Facebook Lead Ads? Free or cost Extra? Not available yet, but founder Troy Broussard has mentioned they are looking at adding them down the road. Can they sync Facebook Custom Audiences? If so, how often? Free or cost extra? MyFusion Helper like PlusThis, takes a goal-oriented approach to keeping Facebook Audiences up to date. What this means is that you can, in real-time, move contact records between custom audiences as they accomplish various campaign & funnel goals in Infusionsoft. How many Facebook accounts are included? Only one Facebook “user” account permitted. What kind of Facebook Ads Training is Available? Limited to training on their tools. What kind of Infusionsoft Training is Available? Limited to two blog posts and training specific to their tools. Customer Support: There is a green “Help” icon in the bottom right hand corner powered by ZenDesk. After submitting my questions, I received a prompt email 30 minutes later with complete instructions. It was initially a little confusing to submit questions as the “Contact Us” is not on the same domain and I visually missed the Help button at the bottom right corner. When submitting through the “Contact Us” page, I received an immediate email to say they had received my response and clicked on a link for more information. This was my double opt in acceptance to their email list. Are you utilizing a sync engine in your advertising efforts? Let us know your thoughts on the products in the comments below! Disclaimer: This article was independently written and produced by Jena Apgar of Brand Dot Blog on behalf of Sync2CRM. Every effort has been made to keep this piece as unbiased and straight forward as possible. If you feel there is a mistake or misrepresentation of a companies’ offering, or a significant change has been made, please feel free to set me straight in the comments below and I will make every effort to set it correct in the post.